I met two deer paired as one. They remain every night and day as hunted objects. Mehraneh Atashi is steadily building a universe, a constellation that can’t be broken, because it already embodies its ruptures, and doesn’t aim to be finished. It’s a universe on its own, but it’s inviting you to inhabit it as well. 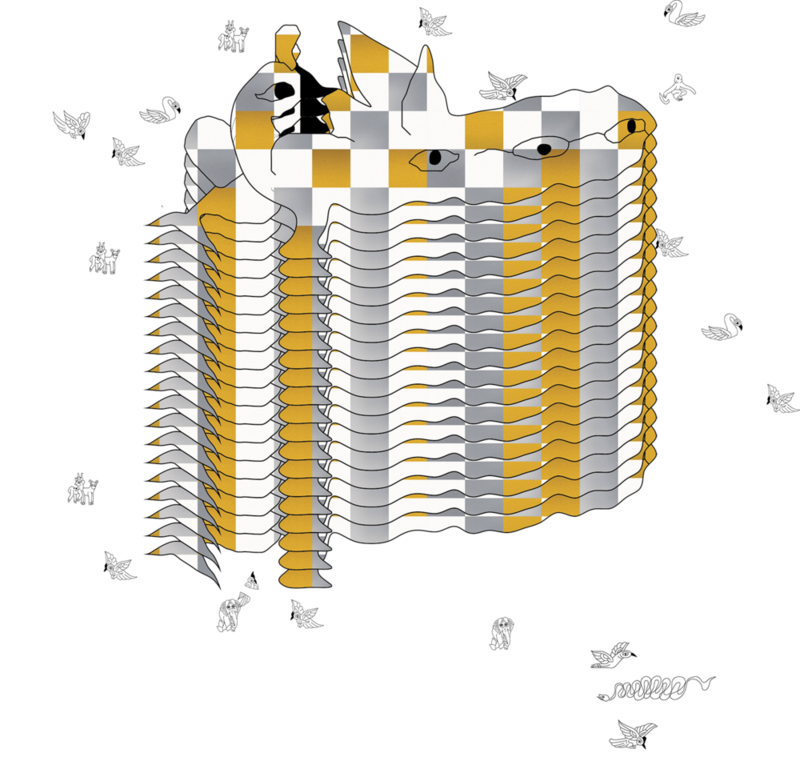 It can affect your way of seeing as it zooms in and out in an irregular sequence. The work is in a constant state of becoming; through excavation into memory, parts of a past are laid bare again, clinging onto a present, transforming and branching out into a possible future that is taking shape in front of your eyes. This publication is unfolding parts of this universe and the process behind it. ‘Now I have the letters of my alphabet, I can make a sentence’, says Mehraneh Atashi in the conversation in the final pages. It’s a new kind of alphabet, non-linear, a language in the making where a Persian story about a group of birds from the 12th century exists alongside a rusty bicycle that Atashi dug up in the Amsterdam canals –while a plastic toy is clapping its cymbals in the background, and the initial familiar imagery of animals distorts into abstraction. 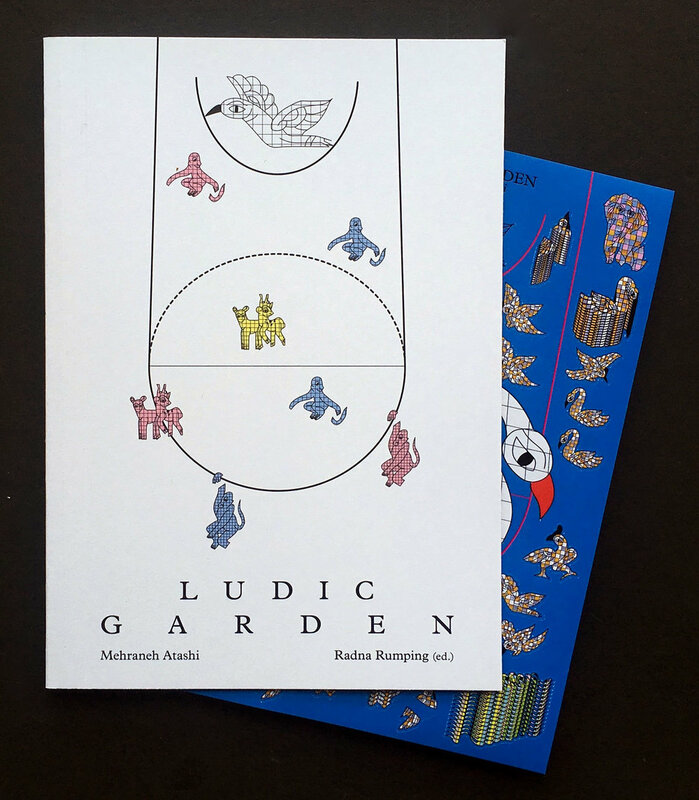 Ludic Garden shows new work of Atashi from 2017–18, together with new versions of previous works, and essays by various writers. Pádraic E. Moore explores the assembling of natural and synthethic matter, with a focus on the decadent appearance of Atashi’s work, in a letter written after a studio visit. Adam Bobbette describes in his essay how birds trained for Indonesian birdsong competitions become recording devices, broadcasting environmental violence and a landscape in distress. Arnisa Zeqo relocates self-portraits of Atashi taken in the cityscape of Tehran (2008 – 2010) to the coast of Albania, where she looks at them carefully again. And somewhere along the way Kate Strain, Mehraneh Atashi, and Radna Rumping sit down on a picnic blanket, marking a piece of land while discussing ghosts, becoming disoriented, and carving out the memory as material. and is now available at selected book stores. It's also possible to order a copy via this website. This publication is made with support from the Amsterdam Fund for the Arts and Dommering Foundation.